Three bizarre horror stories, all of which star Karen Black. Made for TV movies are never really anything to get excited about, they're usually badly wrote and badly filmed and can be mind numbingly boring. 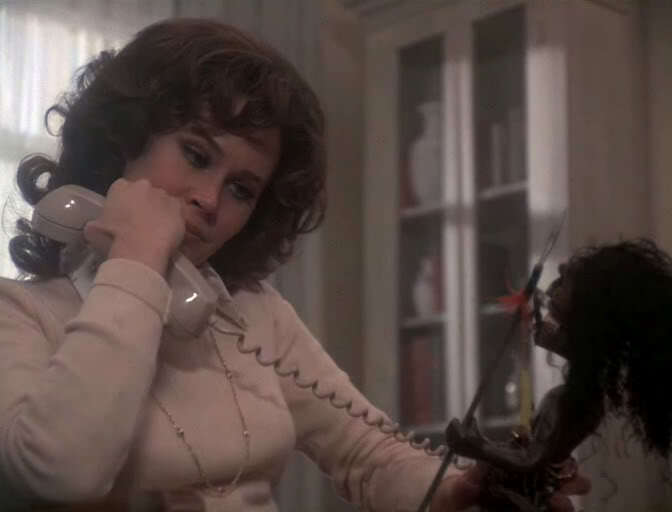 There have been a few exceptions and "Trilogy Of Terror" is one of them. Segment one ("Julie") is about a college student who can't stop fantasizing about his teacher, he's so infatuated that he goes to serious lengths to make her his own. It's a great little story and a great start to the other stories ahead. Segment two ("Millicent and Therese") is a tale of two sisters - one good, the other evil. This segment is the weakest one in my opinion but Black does a great job of playing two characters that are completely opposite and that makes up for it. Segment three ("Amelia") is about an African tribal doll that comes to life. This segment, along with many other horror fans, is my favourite one. Evil doll movies maybe a dime a dozen now, but that Zuni doll remains one of the scariest ever! Yes I know it's only a "12 high doll but if you watched this at an early age too I'm sure you'd agree with me. It's a story that's still talked about to this day and for good reason. This segment leaves the film on a very high note which is always a good thing. I have to ask though, is it bad that I want a Zuni doll of my own? So it's not as shocking today as it was in 1975 and it hasn't aged well but "Trilogy Of Terror" is great entertainment. Karen Black is absolutely fantastic in all the roles she plays. If you love a good anthology movie then I highly recommend this. There's also a sequel, "Trilogy Of Terror II" which was made 21 years later, it's quite good, but I prefer this one.